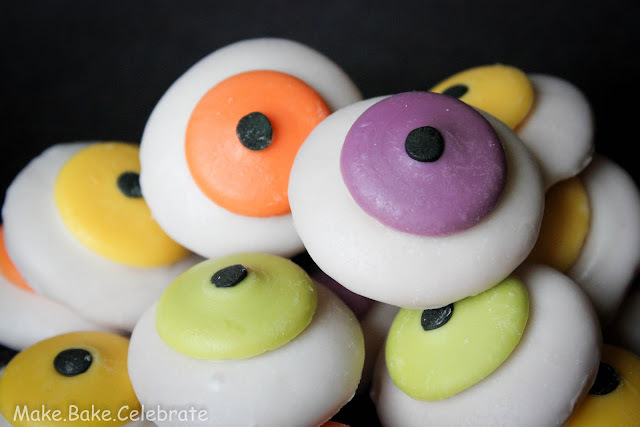 I wanted to share with you some really easy and fun monster eye cookies I made this week. 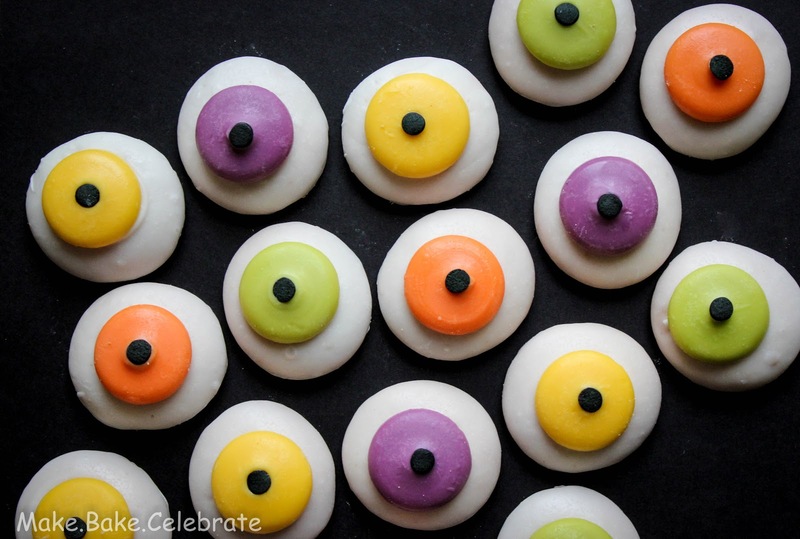 These are so easy, changeable, and pretty darn yummy. 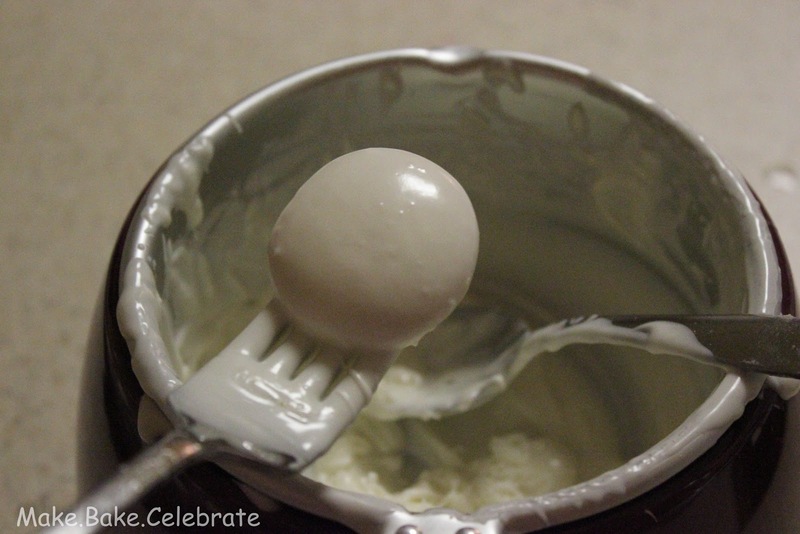 Today I'm just sharing them plain and simple but there are so many different uses for these. With a little creativity you could really have some fun. They could be easily converted into cookies pops, top cupcakes, Oreo pops, pudding toppers, and how stinking cute would these be all over a cake! What would you put them on? I am really digging the cake idea. 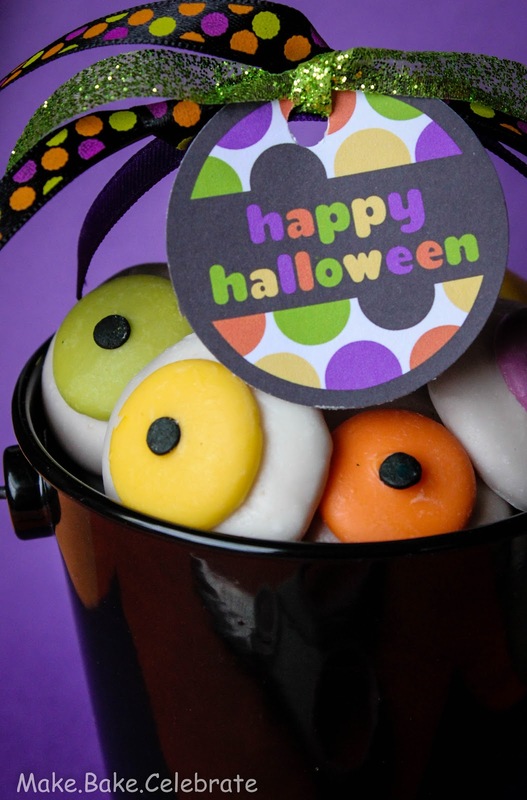 These little guys are actually made of vanilla wafers, dressed up for Halloween. I covered them in chocolate and added a candy melt plus sprinkle in the center. When I set out to make these I tried several different ways to get the black in the center and failed horribly. If only I could have found some black m&m's! Finally I settled for a large black sprinkle, eh who needs perfection. 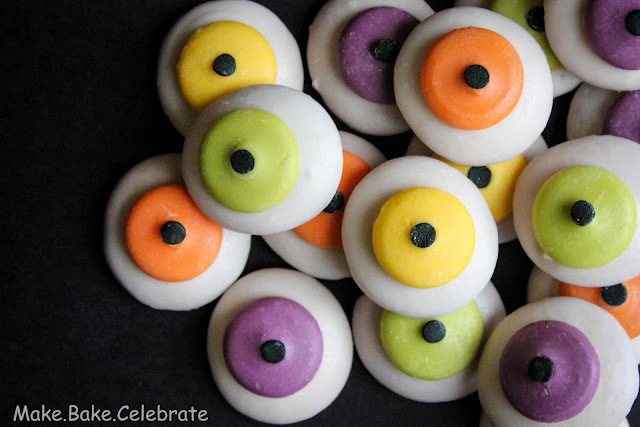 Although I like how they turned out you could substitute something different for bigger centers, and easily turn them to human eyes by using different colored candy melts and maybe adding some red veins. Maybe even a few eyelashes? Really fun, really cute, and really quick. Love it. First off I'm sorry about the overly dark photos. It won't stop raining here in NY, and it's driving me bonkers. We already have awful window light in our house...so you add in a really nasty gloomy day and you get pretty crappy pics. Guess it's time to stop relying on natural lighting and break down and buy a photo lamp :(. I used half a box of wafers, 1 cup of white candy melts, and 24 colored melts to make 2 dozen cookies. Step 1: Preheat your oven to about 170. 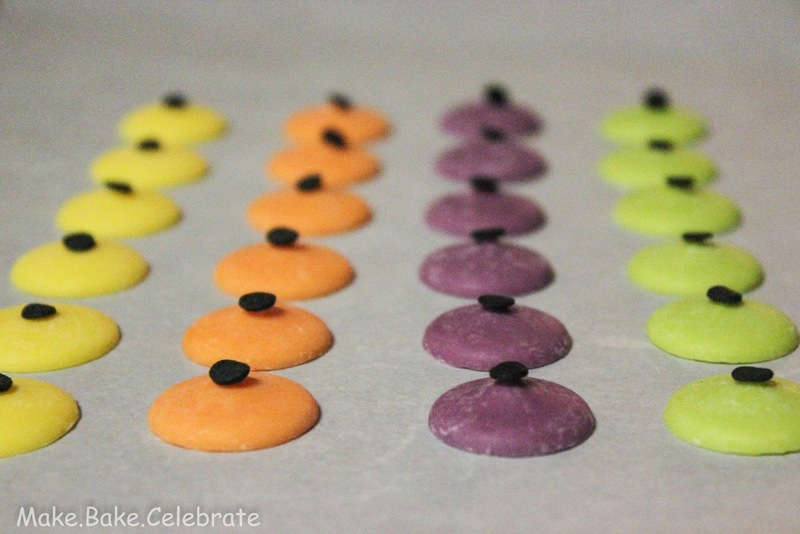 Step 2: Line up your candy melts on a cookie sheet lined in parchment paper. Gently place a black sprinkle on top. Step 2: Place in the oven for two minutes. The candy melts will become shiny as they are just starting to melt. Just be careful! Not something you want to walk away from..or you might come back to a puddle. I recommend staying right there are keeping an eye on them. Your sprinkles should fall into the melts a bit...but if not gently tap them with a toothpick to get them to lay in there. Move them to chill in the fridge for a few minutes until they are hack to hard and easily peel from the parchment paper. Step 3: Melt your white candy melts of almond bark. I melted 1 cup of the white candy melts for 2 dozen vanilla wafers. If your melting in the microwave start by melting in 30 seconds spurts at 50%-60% power stirring in between each time until melted. 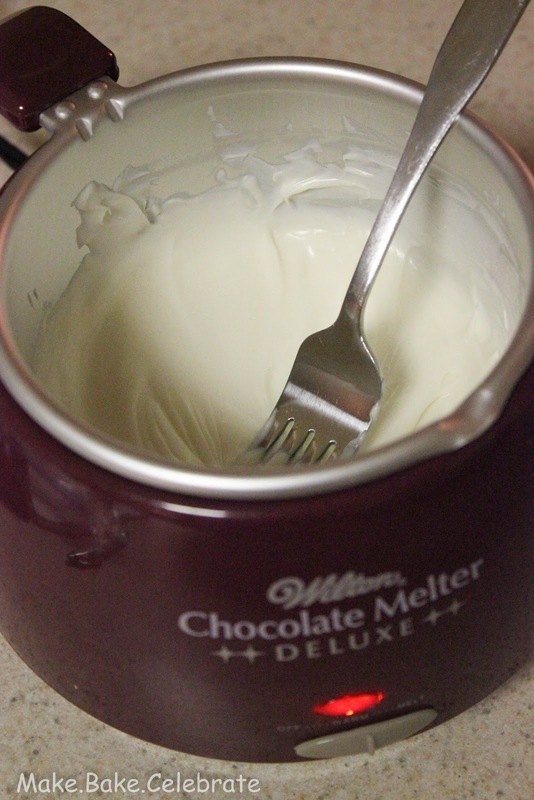 I recently purchased Wilton's chocolate melter and I LOVE it. Put them in and less then 5 minutes later your good to go. Step 5: Cover wafer in the melted white candy melts. 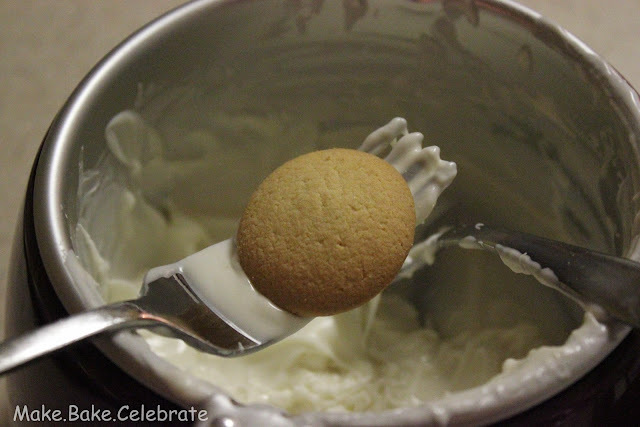 I do so by holding the cookie with a fork and them using the spoon to cover in it. I gently tap on side of bowl until all access chocolate is off. 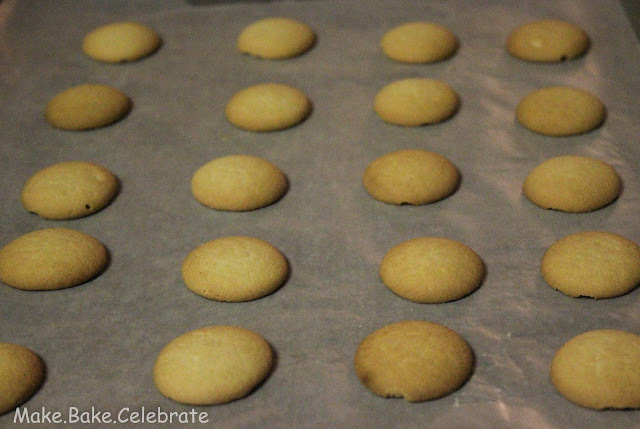 Then move back to wax paper lined cookie sheet. 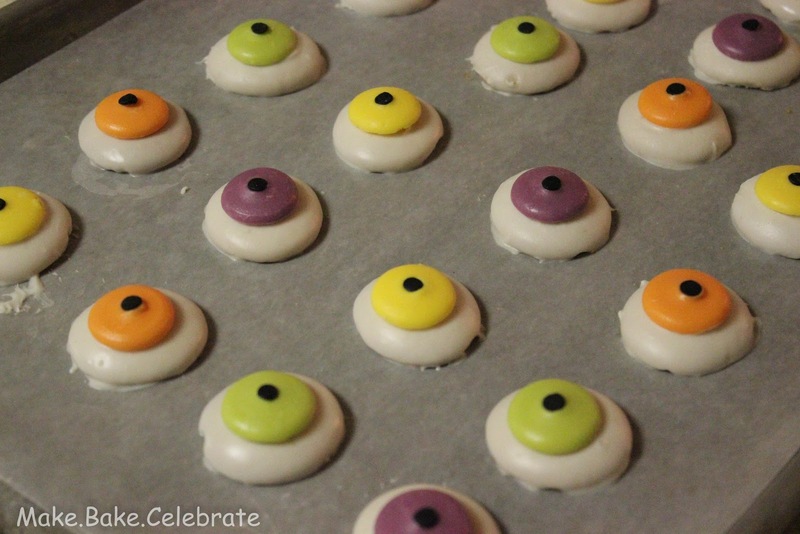 Step 6: As soon as you move the cookie to the sheet place an eye center on the cookie and push gently. 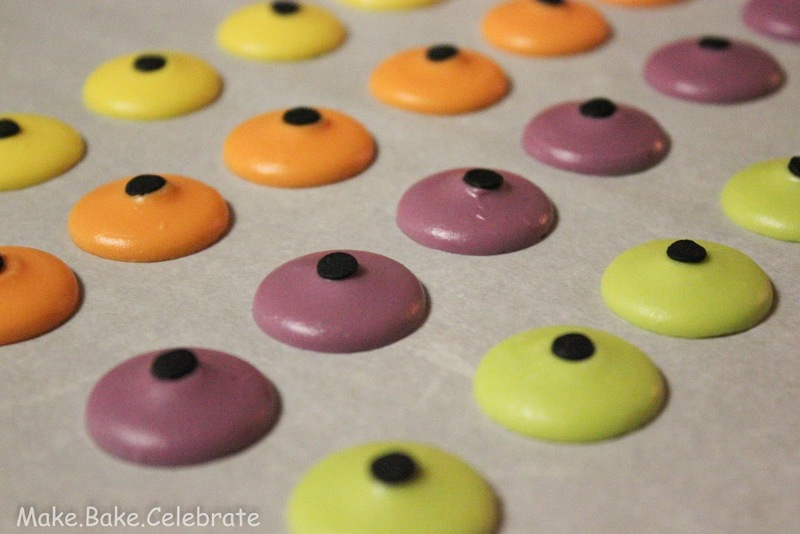 You will want to do each cookie one at a time of the white will set and you won't be able to attach the center part. 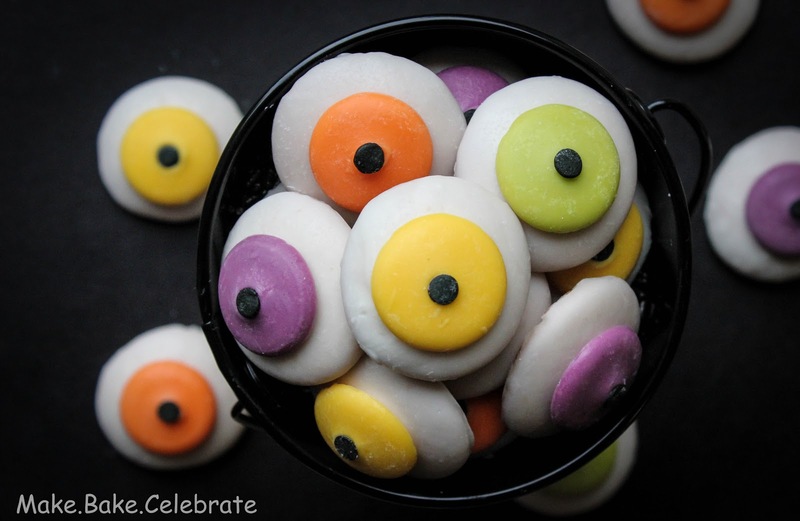 And now you have some bite size monster eyeballs to chew on, serve up, or giveaway. Speaking of giveaway....as I was checking my newsfeed this morning I came across these printables by Amanda's parties to go...which just happen to match perfectly with my cookies! Cute right? She's always makes the best printables! 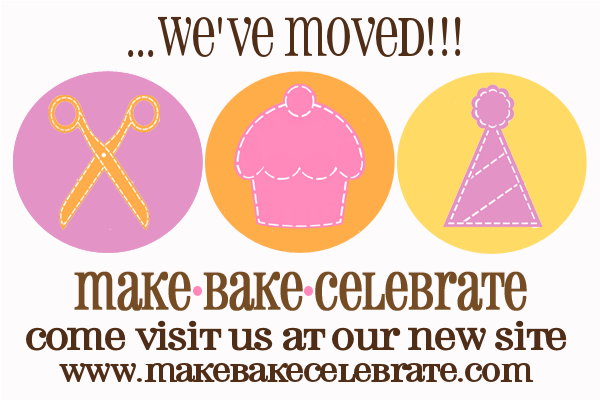 You can get her FREE printables here, and tell her I said hi!